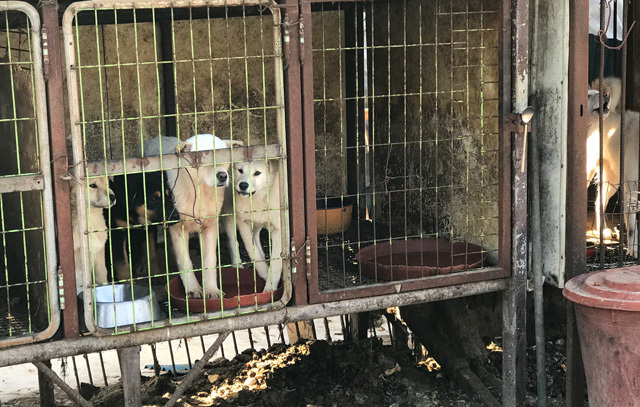 Sign the petition to S. Korean Head of Agriculture, Food, Rural Affairs, Oceans & Fisheries Committee MP Hwang Ju-hong demanding an end to the dog meat trade! Filled with fake, stuffed dogs to resemble the real trucks used to transport dogs from farms to slaughterhouses — LCA and ALW’s “Stop the Villain Truck” is raising awareness for the barbaric slaughter of dogs in S. Korea’s dog meat trade. 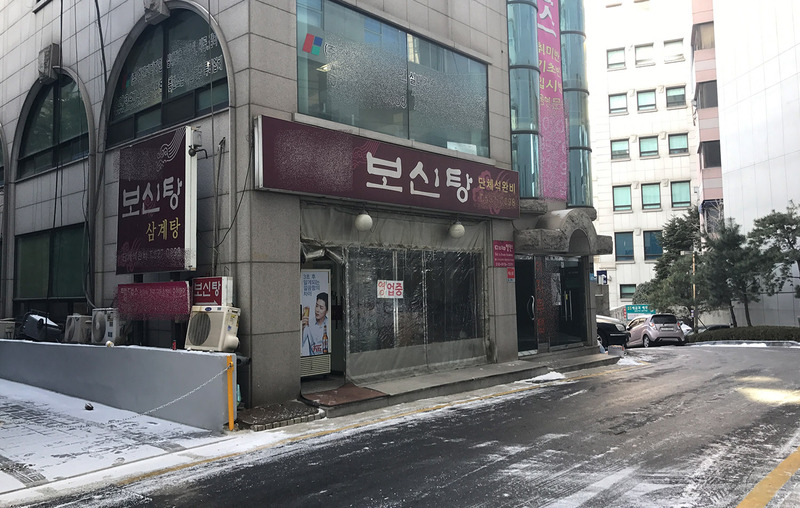 The campaign is also urging S. Korean MPs to review and pass MP Pyo Chang-won’s proposed amendment to the Animal Protection Act to ban the slaughter of dogs and cats for meat during the National Assembly’s 2019 session — which commenced on March 7. To garner support for MP Pyo’s proposed amendment, the “villain truck” gathered S. Korean citizens’ messages in Hongdae Station demanding its passage. LCA and ALW hand-delivered the messages to the National Assembly’s Agriculture, Food, Rural Affairs, Oceans & Fisheries Committee. LCA and S. Korean sister organization, Animal Liberation Wave (ALW), held three demonstrations simultaneously on July 17, 2018, in Los Angeles, California, Washington D.C., and Seoul, South Korea to protest the S. Korean dog meat trade. The protests were held on Bok Nal, the first of 3 nonconsecutive days, known as the hottest days of the Korean summer. Dog meat consumption rises exponentially this time of year in S. Korea as dog meat soup, known as “Boshintang”, is the food of choice to combat the extreme heat and humidity. All three protests were solemn and respectful with thousands of participants worldwide. In L.A., the protest was held at the Consulate General of the Republic of Korea, and in Washington D.C., the protest was at the Embassy of South Korea. The Seoul protest was held in Gwanghwamun Plaza and included a traditional funeral march to The Blue House (the executive office and official residence of the S. Korean head of state). In Seoul and Los Angeles, activists held the bodies of deceased dogs to symbolize the victims of the dog meat trade. LCA has formed a sister organization in S. Korea, Animal Liberation Wave (ALW), with one mission in mind – to end the dog meat trade. Rescuing dogs, one-at-a-time, is not the answer and will not put an end this horrific industry. This can only be accomplished with S. Korean citizens demanding change at the government level. With “boots-on-the-ground” in Korea, LCA and ALW are in a position to affect real change. With a series of strategic events planned, LCA and ALW aim to mobilize S. Koreans in their own country to call for the end of the dog meat trade. Currently, one out of five S. Koreans (2 million – one-fifth of a ten million population) have dogs as companion animals. Old attitudes are changing; dogs are increasingly being considered as part of the family. Dogs are legally categorized as “companion animals” and must not be killed in a brutal way. Despite this act, a million dogs a year suffer torture and brutally die in the dog meat trade. Dogs are not to be consumed as “food”. Regardless of this act, there are 3,000 farms that systematically breed, raise and kill a million dogs a year for meat that is sold to markets and restaurants nationwide. This outdated act still recognizes dogs as “livestock” and is the ROOT CAUSE OF THE LEGAL CONTRADICTION. 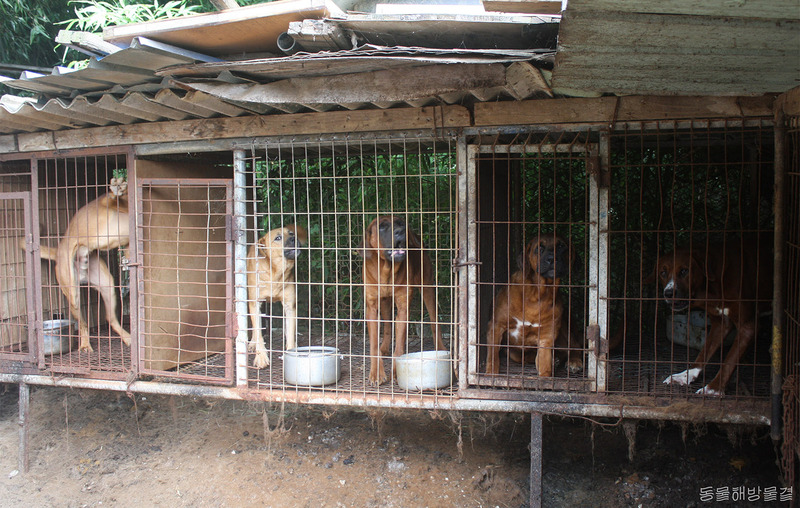 Because of this act, dogs are bred and raised on dog farms. These dogs live and are killed under horrific conditions. Consequently, dogs are considered as both “companion” and “livestock” by Korean law; hence the current legal loophole. The government’s negligence is at the core of the dog meat problem. 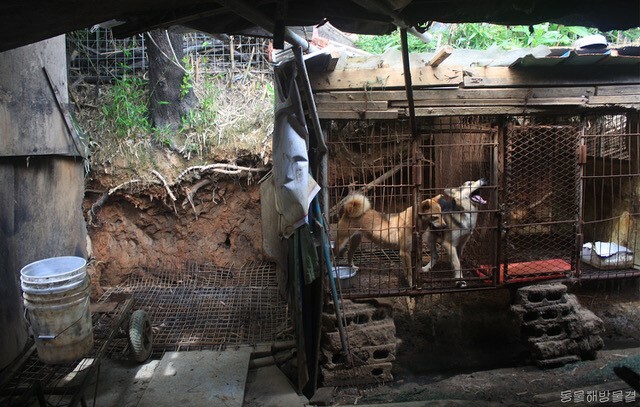 Demands need to be made of the Korean government to address this long-neglected issue, instead of turning a blind eye to the barbaric dog meat trade. The goal of 200,000 signatures was reached! Proposed on June 20, 2018, by S. Korean Member of Parliament Pyo Chang-won, this bill will make it fundamentally illegal to slaughter dogs for meat under S. Korea’s Animal Protection Act. Although dogs are not labeled as food under the Sanitary Control of Livestock Products Act, a million are slaughtered for meat every year. The Animal Protection Act has been largely unsuccessful in protecting dogs since it only prohibits and punishes killing animals “brutally” or “under unjustified reasons”. If passed, MP Pyo’s bill, that prohibits ANY killing of animals unless otherwise stated in other relevant legislation such as Sanitary Control of Livestock Products Act (in which dogs are not included), will be a severe blow to the country’s dog meat trade. Proposed on May 15, 2018, by S. Korean Member of Parliament Lee Sang-don, this bill seeks to remove dogs from the livestock list. Currently, dogs in S. Korea are considered companion animals, yet they are also defined as livestock according to the Livestock Industry Act. MP Lee’s important bill would eliminate the only present legal basis of dog farms and would unite the legal status of dogs as companion animals. While the bill would not outlaw raising dogs on dog farms, it is a significant step in the right direction, in that it would resolve the contradictory status of dogs in S. Korea as both companion animals (under the Animal Protection Act) and livestock (under the Livestock Industry Act). Petition – Ban the Brutal Slaughter of Dogs and Cats for Meat! I respectfully urge the Agriculture, Food, Rural Affairs, Oceans & Fisheries Committee of the S. Korean National Assembly to listen to its dedicated citizens’ and activists’ calls to pass MP Pyo Chang-won’s proposed amendment to the Animal Protection Act, which would prohibit the slaughter of dogs and cats for meat. This year, two surveys (commissioned by LCA and ALW) have shown an 81.2% reduction in dog meat consumption among S. Koreans – with 46% of S. Koreans stating they disagree with dog meat consumption. Furthermore, 44.2% of S. Koreans agree with legally banning the slaughter of dogs and cats for meat. The growing shift in the public’s perception of the dog meat trade in S. Korea is clearly apparent. Please pass MP Chang-won’s proposed amendment to the Animal Protection Act, tabled in the National Assembly on November 19, 2018, which will legally end the country’s outdated and brutal practice and save the lives of millions of dogs and cats. Sign Now to MP Hwang Ju-hong! I respectfully urge the Agriculture, Food, Rural Affairs, Oceans & Fisheries Committee of the S. Korean National Assembly to listen to its dedicated citizens’ and activists’ calls to pass MP Pyo Chang-won’s proposed amendment to the Animal Protection Act, which would prohibit the slaughter of dogs and cats. This year, two surveys (commissioned by LCA and ALW) have shown an 81.2% reduction in dog meat consumption among S. Koreans – with 46% of S. Koreans stating they disagree with dog meat consumption. Furthermore, 44.2% of S. Koreans agree with legally banning the slaughter of dogs and cats for meat. The growing shift in the public’s perception of the dog meat trade in S. Korea is clearly apparent. Please pass MP Chang-won’s proposed amendment to the Animal Protection Act, tabled in the National Assembly on November 19, 2018, which will legally end the country’s outdated and brutal practice and save the lives of millions of dogs and cats. Get email updates from LCA! Conflicting Legal Status: Are dogs companion animals or food? Dogs are companion animals under the Animal Protection Act – Article 1 (Purpose): To protect the life, safety, and welfare of animals by stipulating the necessary conditions for proper protection and management of animals, thus preventing abuse. Article 1 further states its purpose is to cultivate respect for the lives of animals. Article 32 (1) (Enforcement Rule) states, in addition to dogs and cats – rabbits, ferrets, guinea pigs, and hamsters are also protected under this Act as they are reared in homes for companionship. The Sanitary Control of Livestock Products Act does not govern dogs as food – Article 2 (Definitions) does not include dogs under “livestock” as animals intended for consumption. Yet, the Livestock Industry Act is still recognizing dogs as “livestock” Article 2 Enforcement Rule (Kinds of Livestock): The term “animals prescribed by the Agriculture, Food and Rural Affairs Ordinance” in Article 2, Paragraph 1 of the Act shall mean any of the following: 1. mules, donkeys, rabbits, and dogs. 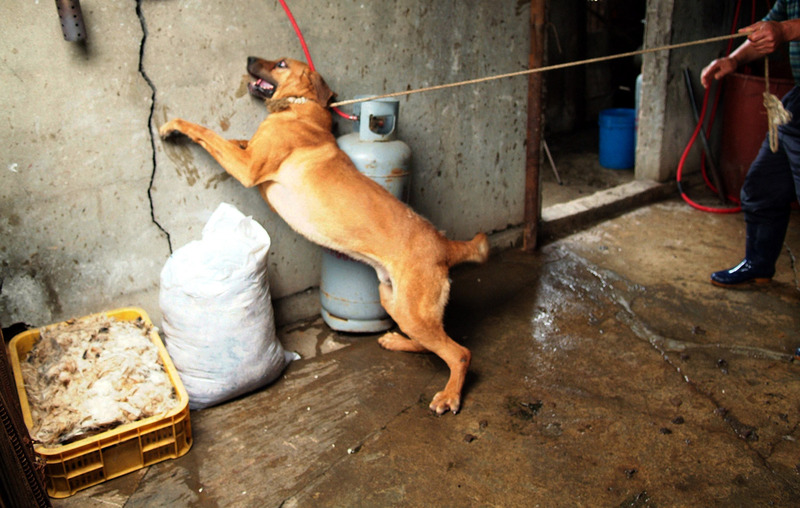 It is through this legal loophole of recognizing dogs as livestock, that dog meat is being produced and distributed. One & Only, S. Korea’s Dog Farms South Korea is the only country in the world where dogs are ‘farmed’ for human consumption. There are at least 2,862 dog farms nationwide that breed and raise dogs systematically for meat. Farms are becoming more and more industrialized in the absence of government control. About half (40.5%) of the dogs slaughtered each year are already being raised in the large-scale, factory-like farms that house more than 500 dogs. 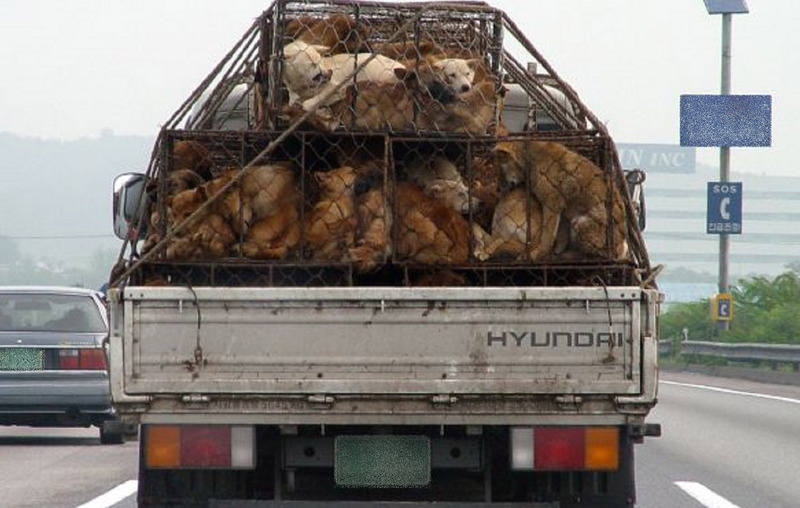 Deadly Highways Dogs are crushed into cages while being transported by trucks. Typically, 12-20 dogs are crammed into one jagged, wire cage and endure the unforgiving heat of summer and the frigid cold of winter during transport. Limbs are painfully broken when they are forced into crates and they endure deep lacerations from the serrated cage wires. Many die during the long journey from the weight of the other dogs on top of them. Dogs, not governed by the Sanitary Control of Livestock Products Act as food, are slaughtered anywhere, hidden from public view. The slaughter process is vicious. Dogs are electrocuted, hung and beaten with metal rods, and sometimes even boiled alive, all in front of the eyes of the other caged dogs. Since there is no law governing how dogs are slaughtered for food, none of the above acts are considered criminal and cannot be prosecuted by law. Restaurants and Markets Dogs are sold and consumed as soup or stew, known as Boshintang in restaurants and markets nationwide. Still to this day, restaurants and retails shops sell live dogs and slaughter them at their backdoor. Abusive: Dog farms are living hell Dogs spend their entire lives on dog meat farms in small, filthy, metal cages 10-12 inches above the ground and are often wounded by falling through the jagged holes. The cages do not provide adequate protection from the extreme weather conditions. No medical care is ever given – they live with untreated wounds, infections and diseases from birth until death. 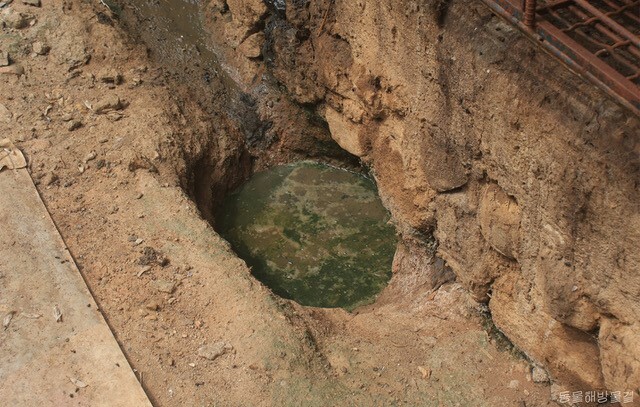 Odor of feces Feces fall through the cages and compile on the ground, causing soil and water pollution. The rancid fumes, instead of fresh air, give constant stress to the dogs that have a highly developed sense of smell. Eating Food Waste Dogs are only given food waste their entire lives, which is more economical for farmers. Dogs often die feeling hunger, especially during winter, when food waste is not distributed regularly. Clean water is not provided as it is mixed in with the food waste. Dogs are often fed boiled up remains of other caged dogs, as witnessed by many activists and investigators. Fear for the outside world When the cages are opened, it is the end of life for the dogs, not liberation. Dogs witness and remember numerous other dogs being dragged out and slaughtered before their eyes, which results in an extreme fear of humans. When a person comes nearby, they respond by barking harshly or cowering at the back of cages, refusing to come out. Rescue operations are difficult as all the dogs know about humans is brutal violence and murder. Disposal of feces and dead animals on dog farms are not handled and treated properly, which poses a threat to public safety and health. Rotting feces most often flow to nearby rivers or underground. Consuming livestock products high in antibiotics causes humans to become resistant to it, inhibiting effective treatment of diseases when needed. According to the World Health Organization, 1 out of 6 people die because of antibiotic resistance. Dog meat, which is not governed by the Sanitary Control of Livestock Products Act, has been discovered to contain antibiotics and germs, considerably higher than what is normally allowed. On November 22, 2018, LCA and ALW launched a beam projection onto the National Assembly building to raise awareness for the cruel dog meat industry as S. Korean MPs met to discuss MP Pyo Chang-won’s proposed amendment to the Animal Protection Act. From September 27 to October 2, 2018, the Flower Dogs will be on display in the main lobby of S. Korea’s National Assembly as MPs convene to discuss and vote on three important bills aimed at ending the current legal basis for the dog meat trade in S. Korea. During the meeting, MPs Han Jeoung-ae, Lee Sang-don, and Pyo Chang-won, along with the Animal Liberation Wave, will call on other MPs to put a stop to the cruel dog meat trade by voting in favor of their proposed amendments to the Wastes Control Act, the Livestock Act, and the Animal Protection Act—which would ban feeding dogs with food waste, unify the legal status of dogs in S. Korea by removing them from the livestock list, and outlaw the slaughter of dogs for meat, respectively. February 2018: LCA and ALW launched The Flower Dog Project, a mobile art installation of 8 dogs touring S. Korea nationwide during the PyeongChang Olympics to bring awareness of the dog meat trade to the Korean public and international tourists. 2018 is the year of the Golden Dog and each flower dog has been given a special name to serve as a visual representation of the dogs suffering in the dog meat industry. Korean and global citizens are encouraged to sign the petition directed at the Korean government demanding the government to resolve the contradictory legal status of dogs into one: that of companion animals. 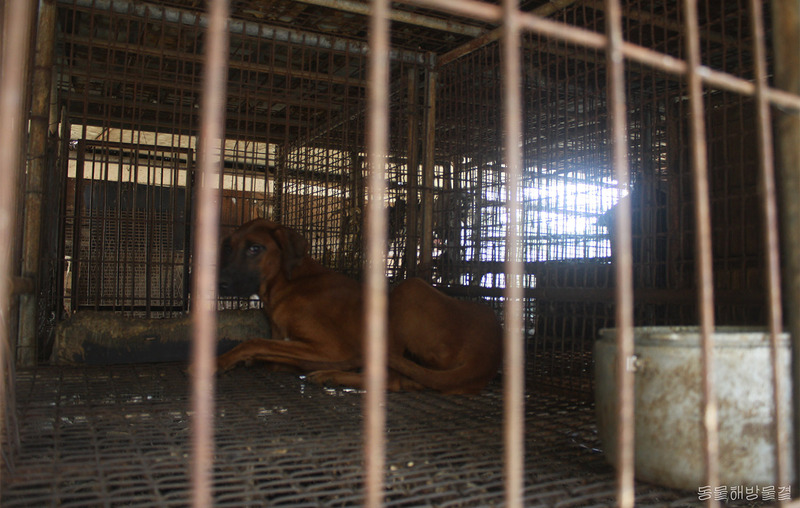 LCA on the ground in S. Korea working to end dog meat! 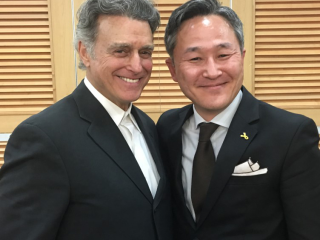 January 25, 2017 – LCA Founder and President, Chris DeRose, met with Member of Parliament Pyo Chang-won at the National Assembly in Seoul, S. Korea, to lend support to strengthening animal protection laws and putting an end to dog meat. It is a positive sign that S. Korea has politicians like M.P. Pyo speaking up for the animals. LCA, Soi Dog and Save Korean Dogs presented Mr. Pyo with over 450,000 petition signatures in support of banning the dog meat trade in S. Korea. S. Korea is the only country in the world with large-scale commercial dog meat farms that breed and raise dogs solely for human consumption. Koreans that eat dog meat claim the meat tastes better the more a dog suffers. Therefore, many dogs are sadistically made to experience extreme fear and suffering prior to death. They are commonly beaten, hanged, electrocuted and burned or boiled alive. Particularly appalling is the three-week-long Bok Nal superstitious ritual, which occurs annually in July and August on what are thought to be the hottest days of the year. Bok Nal participants consume dog meat soup (boshintang) in the belief that this dish has a cooling effect. Dog meat is far more common among the older generations in Korea; younger generations do not generally participate in eating dog meat, and many are speaking out against it. In spite of worldwide public outcry, however, the Korean government has traditionally turned a blind eye to this practice. 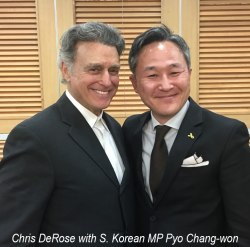 CLICK HERE to read an interview of Chris DeRose published in The Korea Daily discussing Korea’s dog meat trade. 1) Sign the petition above asking S. Korea’s government to take a stand against dog meat. 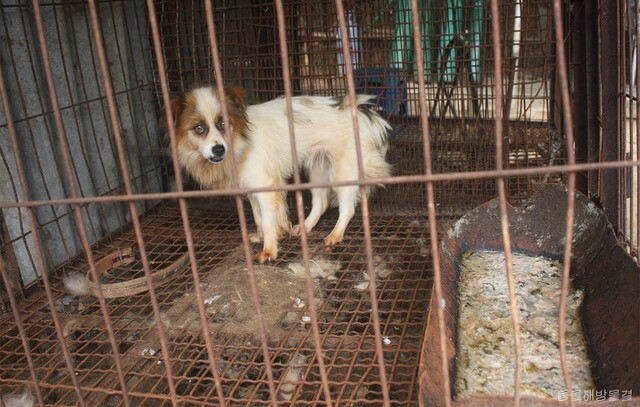 2) Educate others about S. Korea’s dog meat trade and ask them to take action. 3) Make a donation today to help LCA continue the fight against dog meat.